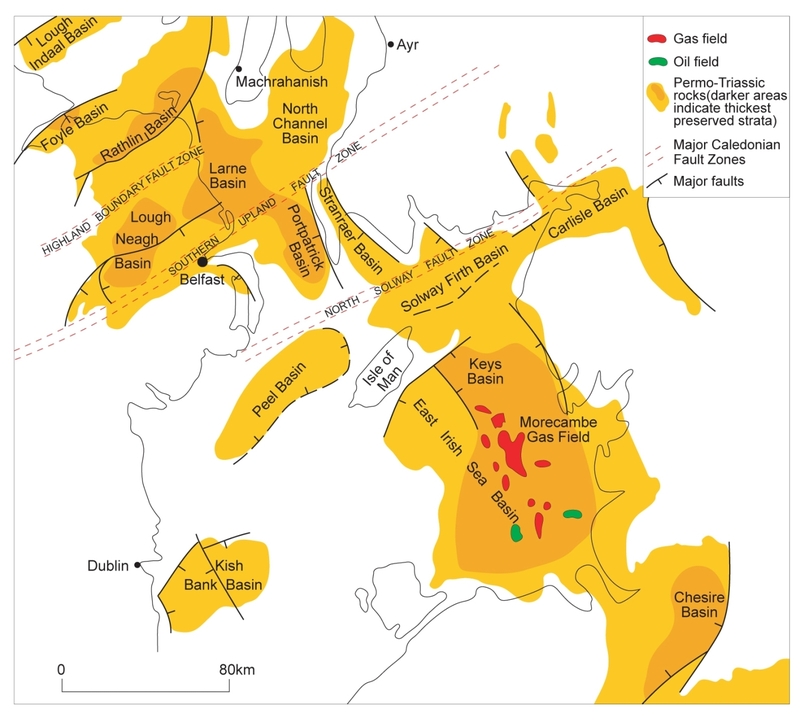 Exploration for oil and gas in Northern Ireland began in 1965 and whilst gas has been detected it has not been discovered in commercial quantities. Despite this initial lack of success the rocks beneath Northern Ireland may yet be found to contain undiscovered accumulations of oil or gas. 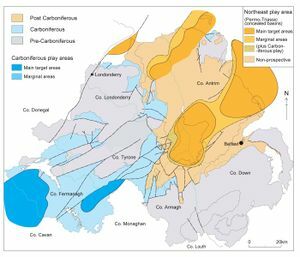 The two most prospective areas are in the Lower Carboniferous rocks of Co. Fermanagh and south Co. Tyrone and the Carboniferous to Triassic rocks beneath the Antrim Plateau (P947901). The former has a history of gas shows from a small number of exploration wells but the prospectivity is reduced by the poor quality of the low permeability tight gas sandstone reservoir rocks. Similar unconventional gas resources are exploited in North America by hydraulically fracturing the reservoir to stimulate gas flow rates. The latter area is even less well explored because of the technical difficulties in imaging the geological structure beneath the thick cover of Palaeogene basalt lava (see Mantle plumes, ocean spreading and the North Atlantic Igneous Province, Palaeogene extrusive igneous rocks article). Consequently only five exploration boreholes were drilled between 1971 and 2001. The underlying geology has many similarities to that of the East Irish Sea Basin which hosts the ‘giant’ Morecambe Bay gasfield  (P947877). The prospectivity of the two areas may be assessed on the basis of the nature and distribution of the potential source, reservoir and seal rocks. Basin evolution is also important in that its history affects the maturation of the source rocks and the expulsion of hydrocarbons, the reservoir quality and creation of traps, and the relative timing of these processes. ↑ Department of Enterprise, Trade and Investment. 2000. Minerals and Petroleum Exploration and Development in Northern Ireland, 20–25. The Stationery Office Ltd., Belfast. This page was last modified on 25 September 2017, at 13:49.